The gut-wrenching footage of an emaciated polar bear dragging himself across a snowless landscape in Canada was meant to provoke a visceral response. It did exactly what was intended, with billions of people all over the world collectively groaning in anguish. The video was shot in August last year by a one of the founders of a non-profit called SeaLegacy and was posted to Instagram in December with the caption “This is what starvation looks like” as part of a wider discussion regarding the effects of climate change. National Geographic which partners with SeaLegacy reposted the video with a new caption “This is what climate change looks like” and the message being sent was unambiguous, the emaciated polar bear’s fate is the consequence of climate change. The Nat Geo video quickly went viral with an estimated viewership of 2.5 billion, setting a site record for the company’s website and receiving widespread coverage in the media. The response from the public was fierce. Many people were angry that the film crew who shot the footage did nothing to help the bear. The individual who captured the footage said it would have been illegal to even approach the bear leave alone feed him or do anything else to alleviate its suffering. Whilst to some extent that is true, the crew could have contacted the closest conservation officer who could have euthanised the polar bear and then perform a necropsy in order to determine what was causing the bear’s condition which was most likely to be a cancer. That however was not convenient to the agenda SeaLegacy wanted to push so instead the film crew allowed the bear to simply swim away and continue suffering. Many viewers were not happy that a sick animal had been used to advance a political agenda. 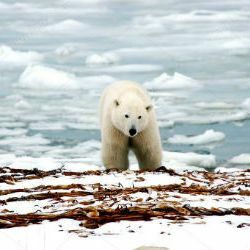 It is true that climate change is a problem and polar bears are one of the species likely to feel the consequences most acutely, but there is no need to lie in order to make that point. The sea-ice loss that year had not been much above average last year and no other polar bears were in the same condition, so climate change could not have been blamed.